Report simmering in indicates that Nollywood veteran, iconic personality and politician Richard Mofe Damijo is rolling up his sleeves to take the stage once again with his mesmerizing acts. According to the source, Richard will make his reentry with by starring in a Nigerian popular soap opera TINSEL which airs on cable Network, as he awaits other movie roles in the pipeline. As the current Commissioner of Commerce and Tourism in Delta State, Nigeria, Richard is arguably one of the best Nollywood has ever produced. So a reentry is not only good news, but probably an attempt to benefit from years of hard work, and sheer passion for acting. We wish him the best! A foreign website (JEZEBEL) voted Dbanj as the best dressed at the just concluded BET Awards that took place on June 26 at Shrine Auditorium in Los Angeles. 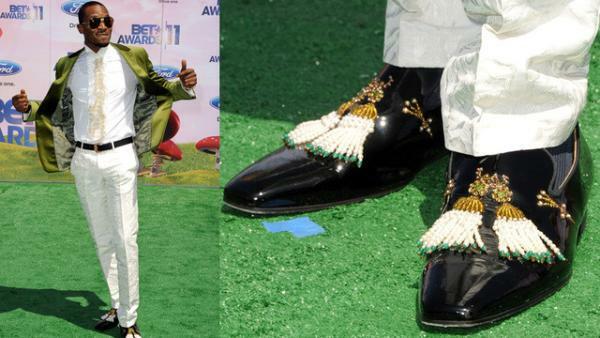 I'm not familiar with Nigerian singer/songwriter D'banj's work, but he's my pick for best dressed. Such attention to detail! His pants look like they were crafted out of some Italian nonna's tablecloth. And those aren't ruffles on his shirt—they're tasseled beads.